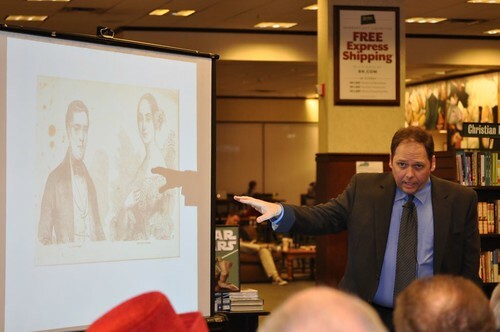 This Thursday, March 3 at 7:00 p.m. at Barnes & Noble Bookstore, University of North Alabama historian Matthew Schoenbachler talked about Kentucky’s most famous murder case. After his talk, Schoenbachler signed his new book Murder & Madness: The Myth of the Kentucky Tragedy. This Thursday, March 3 at 7:00 p.m. at Barnes & Noble Bookstore, 1680 Campbell Lane, University of North Alabama historian Matthew Scheonbachler will reveal the truth about Kentucky’s most famous murder case. Schoenbachler, used materials from the Kentucky Library and the Manuscripts & Folklife Archives in writing his new book, Murder & Madness: The Myth of the Kentucky Tragedy (University Press of Kentucky, 2009). “The Kentucky Tragedy” refers to Jereboam O. Beauchamp’s murder of Colonel Solomon P. Sharp in Frankfort on November 7, 1825. Schoenbachler deftly approaches the murder by examining the three parties involved: Sharp, Beauchamp and the ever provocative Anna Cooke, whom he calls the “diminutive fury.” It is a story of unbridled passion, romance and revenge. The tale may resemble the plot of a modern romance novel, but it is a true tragedy whose chief characters hailed from south central Kentucky. Within just a few short months, the three participants die: one from murder, one from suicide, and one at the end of justice’s rope. For more information call 270-745-6121.